This entry was posted in books, collecting, literature, obsession, Poetry, Poets, Writing and tagged books, collecting, first editions, obsession, poetry, poets, rare books, writing by robert okaji. Bookmark the permalink. Gotta love the books! Keep filling that library! Mine as well! I’ll purchase digital copies for research, or for “disposable” reading, but paper is always my first choice, especially with poetry. I would like to read this novel. I love the density of language in this piece. Yes, books are also my drug of choice. Thanks for that post, Robert. I’ve been loving your poems and now I feel I know a bit more about the person behind them. Thank you. I don’t write much prose, but every now and then something escapes! Oh I do love books too! I get it, I do. Great story (I had to laugh at your description of the furry massage table), and a lovely selection of books in your photos! I wish I had a photo of the furry massage table. It was, uh, different. I really like the precision in your choice of words in your poetry. Your narrative piece here is just as polished and exact…My latest book addiction is to latch onto an author and read as many titles as I can find. Graham Joyce and Somerset Maughan have been recent obsessions. It feels so good to be immersed in the thoughts of a really good writer. How do you assess translations? I find I get very attached to certain translations of poems I love but always wonder what might be off the mark. I am fond of Cavafy (The City is one of my all time favourite poems), but translations vary widely, even from the same translators. I am also reading a lot of Paul Celan and I find the same. I must confess that I don’t worry much about whether they’re accurate. I’m much more interested in the translated poem drawing me in and not letting me out until I’ve read it. The piece has to work as poetry. There’s been some discussion of this on the blog. You might search for “On Parting (after Tu Mu) and peruse the comments. Also, a recent posting, “Bright Autumn Moon” benefits from reader comments, too. You might pick up a copy of 19 Ways of Looking at Wang Wei (which is also discussed on this blog) or perhaps a copy of Felstiner’s Translating Neruda: The Way to Macchu Picchu. These offer excellent insight into the art of translation. I wouldn’t know how to begin assessing translations of Celan, but I have several at hand that all provide something that feeds my need. how I know the feeling! pretty much followed the same path. yes, the whole nine yards…including a brief stint with a store, open on weekends. but, you only live once! But don’t we, through books, live a hundred lives? I sometimes miss the book business, or at least the idea of the book business. I so recognize that itch. My consolation when I look at the towering stacks in each room of our old house – insulation, for the mind and the body. We share this ability to rationalize our obsession! Enjoyed this. I too struggle with buying books against my better judgement. There’s a sort of siren song that plays whenever I see a table of used books for sale. I no longer haunt used book stores and thrift shops like I did when I was young, but I cannot resist looking at displays of books if I happen upon them. Sure. Care to join me, Michael? ‘There were always too many. There were never enough.’ –a familiar feeling. I am jealous of your once having a whole store full of books and your recent haul. That feeling still hasn’t left me, but I’m mostly able to ignore it these days. 🙂 The bookstore was maddening, fun, exhilarating, exhausting and educational. I’m glad we did it, but I’m also pleased to be done with it. 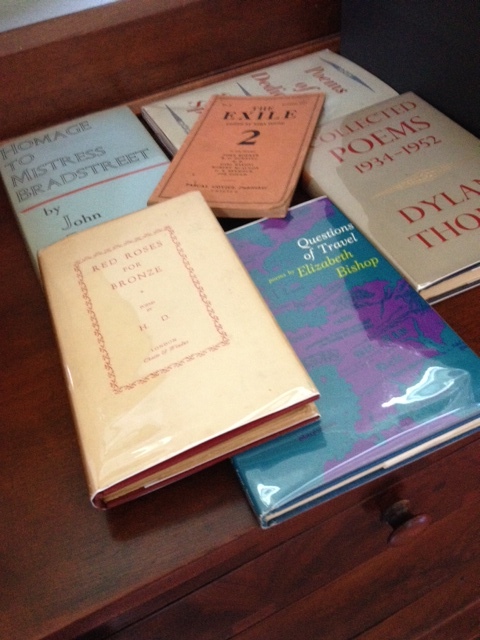 The recent haul was wonderful – most of my poetry purchases are made online, as no one seems to have what I’m looking for when I’m looking for it, and finding such a selection in one place, and at bargain prices, was a dream come true. I’ll see you tomorrow, Judy. I’m on my way! Just kidding. Heh heh. The itch is contagious. It has crossed continents, oceans and seas all the way to the ‘Great Southland’. It even spread to my little town and this office. Thanks for a riveting post. I zoom read through paragraph one and had to keep going. It’s everywhere, Simon, everywhere! And thank you for your kind words. May you never recover from the itch. This sort of purchase doesn’t happen often! I tend to add books to my collection one at a time, mostly via Abebooks.com. Abebooks is quite expensive (I have to pay for shipping, remember?)!! I buy from Book Depository. No judgment coming from me. Full speed ahead with the book collecting, my friend! I’m a bookaholic for sure, my husband is not, and it has proved to be challenging for us at times. Plus there are the decades of journals I have filled with my own musings about the absurdity of life. I have no idea what I’m going to do with all of my books, but who cares? Beautifully written post! 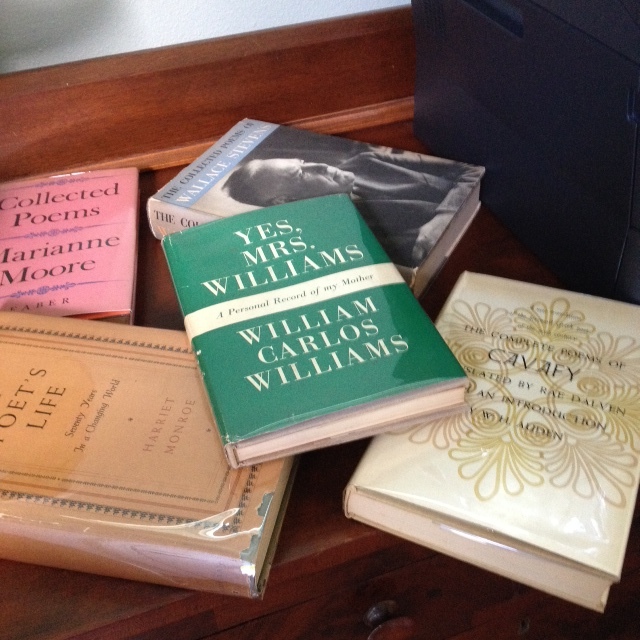 Occasionally my wife and I will gather up books and magazines that we’ve had for awhile– everything from novels to school books to self-help books to various paperbacks– and bring them to one of the local adult schools for freebee pick ups. On of those days we must’ve dropped off 20 books/mags (including a college human histology book) and they were all scarfed up in about 15 minutes. So there’s definitely a desire for folks further educate/entertain themselves. Nice post. Thanks, A. I also enjoy spreading the wealth, so to speak. It’s pleasurable to share books! Bob, too much to say and too little time before my nap to say it, so I promise an email will be on the way before the Ides of July…or whatever! But I’ll say this…your prose is every bit as good and enjoyable to read as your poetry. Which brings me to this — Bought your book (“If Matter Could Reform”) today and am having a blast with it! Really feel sorry for those who don’t enjoy poetry! And knowing the author is a special bonus!! Have a good nap, Ron. And thank you! Bonus, penalty – what’s the difference? You do know that all friends of the author are required to order multiple copies? Ha! Ahhh, books and bookstores; my brother, John, recently sold his old and rare bookstore (The Seattle Book Center) and retired (age 73) after 30+ years of running the place. Book have been a major part of our family’s life since I remember. This post brings back a ton of memories for me. I never lived in ready proximity to a bookstore until I moved to Austin for school in the late 70s. Of course I applied to quite a few jobs at bookstores, but to no avail. In retrospect, that was probably for the good, as I picked up other skills along the way. But books have always been a passion. I’m so glad this post brought back memories to you. How nice to meet you as an essayist, Robert, and also to learn a little more about you! I greatly enjoyed this. I’m so pleased you enjoyed this! I don’t attempt much prose as it’s difficult for me and I’m rather lazy. 🙂 I’ve posted a few other prose pieces on this site: “Which Poet, Which Beer,” and “Poet’s Pantry” are two that come to mind. There might be others, too. This was so interesting to read, and kind of poignant too. In my non-writing life (or non-poetry fiction writing life) I am an attorney and have often been in situations of having to sell books/libraries–some with wonderful book–and I am always saddened by how little they get–at least in that type of situation- – I know if you are on the buyer’s end they are more expensive–but there are just so many wonderful books, and although i confess to having and loving a kindle (it’s just very good for my eyes), there is an incredible charm about an old book that has been looked at, traveled. Anyway, thanks for sharing that itch! k.
It is the poignant part of the book business. In general, if you can get 25% of market value for a good but not spectacular collection you’re doing okay. The used/rare book business is demanding, and there isn’t much margin for error. I, too, have a kindle, which I use to read “disposable” books, and when I need a book immediately for research or to satisfy curiosity. But when all is said and done, the heft, the texture and even the odor of a book of a certain age just can’t be beat! Yes, you are right! Good luck! K.
Well said well written and thank you for the insights of your creative passion. Great work, don’t stop. I too love the feel of paper in my hands, especially old beautifully bound and crafted books. Digital leaves me cold. I am new to your blog. Looking forward to diving in! Thanks for dropping by mine. Thank you. I’ll be certain you visit your blog again! Enjoyed your piece on Krishna and the flute. Thank you so much. Your words give me the encouragement I need to know that I am resonating with folk out in the ether. Strength to your quest…! Ten years in bookselling for me. It never leaves you. It never leaves you, but it does get a bit worn at the edges, perhaps a little cocked and dog-eared. Man, do I empathize with this one. For a reaaly classy bookshelf AND bookends……just jam your favorite books between the harp strings and be the envy of everyone in Heaven! Oh, sure, if you’re into ostentatious displays. But everyone knows that harp strings groove the book edges, and that’s not good! Isn’t that like a banjo on legs? Oh..do you know what they call someone who likes to hang around with musicians? Hey! Here’s something I think you might enjoy reading: Palm-of-the-Hand Stories by Yasunari Kawabata. I love Kawabata, but have not read this. Thank you. Once it has hold of you, it doesn’t let go. Yes it doesn’t and yet I think all book lovers have it in them. I wonder if it is the power of books that hold us or it is our inherent love for books that subjects us to the intoxicating power of books. Perhaps a little of both. Or a lot of both! I really liked this piece! Definitely empathised with the all-consuming nature of being in business. I’ve had a few shops – peddling food, coffee and ideas. It became a form of performance art. I’ve also moved way too many times, lugging boxes of books every time. I’m still positive I need them all.